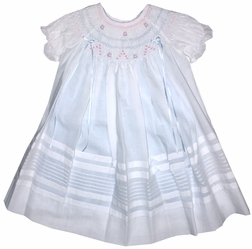 Beautiful white dress by Will'Beth bishop smocked. 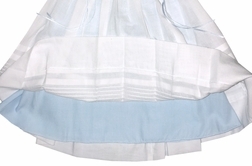 The dress has a blue slip to give a light blue sheen to the dress. 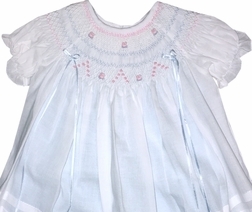 The smocking is embroidered with blue and pink rosebuds and blue ribbon bows on the front. The bottom of the dress has horizontal pintucks around the bottom.